Intecsa Industrial understands that the success in the sector of LSTK – EPC Services is through a combination of excellence in the technical execution along with expertise in project integration management. Fully integrated team during all project phases. Team building and coaching to motivate the team and to focus on common goals. Selection of staff based on quality, experience and ability to perform and deliver. Use of Intecsa Industrial‘s experience and knowledge of local markets to obtain the best selection of Subcontractors. Use of extensive experience to guarantee successful commissioning & turnover. Maintain a dedicated focus on HSE and quality from design to commissioning and hand over. Use of state-of-the-art IT systems to simplify and speed up communications between the project team, owner, vendor, subcontractors and any other party involved in the project. 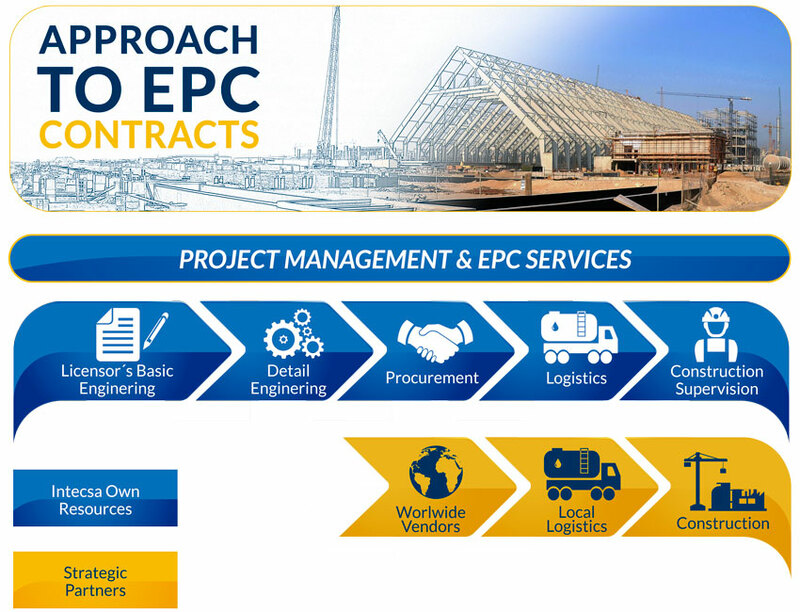 Once an EPC project opportunity is identified, the Business Development Department jointly with the Operations Division moves forward and pursue the project by managing and coordinating the resources required. To ensure an efficient coordination, Intecsa Industrial uses in-house tendering procedures to address and coordinate the tender information and take the fundamental decisions regarding the participation in the tender. The advantage for our clients and partners is that we conduct our relationships from a single point of contact, through the guidance and strategic supervision of Intecsa Industrial management. Intecsa Industrial‘s approach to locate the right partner through a win-win approach where we share our abilities, knowledge and experience to complement each other for mutual success. Transparency and openness with our customers are the cornerstones of Intecsa Industrial‘s Project execution strategy. With all team members aligned to work towards achieving the success of the Project. Whenever a issue pops up during the project execution, Intecsa Industrial‘s team is attuned to identify and rectify accordingly develop solutions that will mitigate the risks without significantly affecting the progress of the works. Intecsa Industrial‘s employees are fully committed to ensure that the project is completed within schedule, with high quality standards, safe and ready to safely be operated. Identify the Project key drivers for maximizing their return on investment. Alignment of the project team, contractors, suppliers and operators to the owner‘s objectives for success. Undertake sufficient forward planning prior to detailed execution to ensure maximum value added at project definition stage. Mobilize high quality and experienced staff for all key positions. Identify all interfaces and put a coordination plan in place. Derive a contracting strategy to maximize value offered by different parties. Develop a project schedule to identify the effects of long lead items, availability of local resources and security issues. Intecsa Industrial implements these key success factors by allocating high quality resources to the project and, excellent preparation of the project planning. In each project, we create teams who bring experts from all the different disciplines involved in the project. All team members have access to advanced software and communications programs to analyze project progress data or any other relevant project information. Intecsa Industrial has been a leader in this area, pioneering the use of computerized systems for project planning, follow-up and management. As important as technology is for the success of an EPC project, the skills and commitment of the people involved are even more critical. That‘s why, in addition to the high level of ability represented by the group as a whole, each of our task-force teams is headed by a manager carefully selected for the skills and experience needed to lead the entire project. The team manager is the client‘s clearly identified point of contact and is responsible for handling all issues affecting the on-time and on-budget completion of a project.